Clash of titans over Internet piracy and power. Wikipedia goes dark in protest. We’ll look at the big debate. Go to Wikipedia today and you’re going to get a dark screen. Same at Reddit and BoingBoing. Even giant Google has blacked out its famous logo – though its searches go on. The target of all the Internet protest is legislation on Capitol Hill aimed at stopping Internet pirates – pirates stealing movies and music and more. Critics of the legislation say it takes a full cannonade to a narrow piracy problem. That it threatens to sink Internet freedom and innovation under censorship and firewalls. It’s a battle royal. This hour, On Point: the clash of titans over Internet freedom and piracy. David Gelles, U.S. Media and Marketing Correspondent for the Financial Times. His recent piece on SOPA can be found here (registration required). Alexis Ohanian, founder of the website Reddit.com. Reddit's explanation of the legislation is here. Marvin Ammori, legal Fellow at the New America Foundation’s Open Technology Initiative. Sandra Aistars, Executive Director of the Copyright Alliance. Former Vice President and Associate General Counsel at Time Warner Inc.
Digital Trends "While SOPA and PIPA have the same goals, and much of the same provisions, they are not identical. The wording of each section is often only slightly different, though the meaning is the same, making these differences meaningless." Wall Street Journal "Supporters of controversial antipiracy legislation face a struggle to regain momentum after the White House sided with irate Internet companies and users over the weekend and complained that the proposal could hurt innocent companies and undermine cybersecurity." Washington Post "Wikipedia, Reddit and Boing Boing are planning to black out their services Wednesday to protest the Stop Online Piracy Act and the Protect IP Act by showing users the bill’s effect on Web companies. These companies object to language in the bills, which are aimed at stopping online piracy on foreign Web sites, that grant the U.S. government the right to block entire Web sites with copyright-infringing content on them from the Internet." 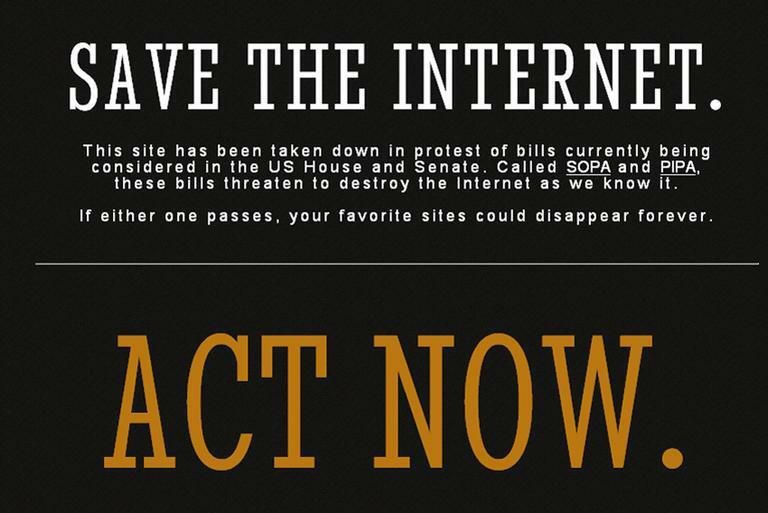 You can find a listing of where your congressional representatives stand on SOPA here from ProPublica. This gallery of screen captures shows just a few of the major sites that have altered their content on Wednesday Jan. 18, 2012 as a sign of protest against anti-piracy legislation now being considered in both houses of Congress. "The Day the LOLCats Died" by Chris Parker. A song protesting SOPA and PIA, to the tune of "American Pie," posted to the Youtube channel LaughPong. This program aired on January 18, 2012.